Our Furnace Repair technicians service Santa Clarita 24 hours a day. Call Pacific Coast when you need an honest and reliable Furnace Repair company in Santa Clarita, CA. Our repair technicians specialize in servicing all makes and models of heat pumps, wall heaters and Furnaces. We are available for 24 hour emergency Heater Repair service, offering routine Heater Tune ups in Santa Clarita to keep your furnace working as efficiently as possible throughout winter. What Are Common Problems With a Furnace? Thermostat malfunction. An older thermostat can wear out or be damaged, which limits your control of the heating system, say you set your thermostat to 72 degrees some older worn out thermostats can go over your set temperature or below sometimes by up to 5 degrees+/-. Upgrading to a programmable thermostat will solve this problem and also enable you to cut heating costs. Mechanical problems. The blower motor or bearings in a typical furnace are all wear and tear items. When these parts become worn, they must be replaced to avoid air flow problems or total system shutdown. Improper venting. Any furnace that burns fuel be it gas or propane requires an air supply for the combustion process, and a venting system to expel combustion gases. 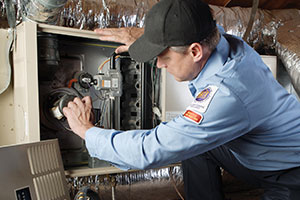 Your furnace technician will check for proper ventilation during regular service calls. Outdated, inefficient performance. Today’s high-efficiency, sealed combustion furnaces can operate at 90% efficiency or better. Older furnaces may only reach 75% or 80% efficiency, even in perfect conditions. Upgrading to an efficient, ENERGY STAR® furnace is a smart option in many cases. Leaky, uninsulated ductwork. Although ducts aren’t part of the furnace, their condition has a huge impact on overall heating of your home or business. By sealing and insulating the ductwork system, you can improve system efficiency by 15-20% or more. The burner, which includes the heat exchanger, draft inducer and venting. Here, a flame is drawn into the heat exchanger by the negative pressure produced by the draft inducer. The hot gasses produced by the combustion of the flame pass through the chambers of the heat exchanger, heating its metal walls. The gasses cool as they transfer the heat to the heat exchanger and then enter the draft inducer blower to be pushed into the venting pipes. The exhaust gasses are then directed out of the firebox through the vent pipes. The controls and safety devices, which include a gas valve, ignition control, igniter, flame sensor, transformer, limit control, blower control board, and flame roll out switches. A safety system must be in place to stop the flow of gas if the furnace ever overheats or if a part is not functioning correctly. When winter settles in Santa Clarita, nights can get really cold! Our Heater Repair experts can offer reliable and cost effective heating solutions, whether you need a new central heater installed or having your heater repaired, we take pride in offering each client a customized solution. Not every central heating system is the same. You have just returned from work, it is very hot outside, you enter your house and the first thing you do is switch on the Heater and in a short time your home is cool. You forget all about the Heater and immerse yourself in your household activities. When the heater was installed, the technician had told you that regular maintenance was necessary but you have forgotten all about it and one fine day when you find that the heater is not working, you remember his words and feel that you should have acted on his advice. Most people are like that only; they remember sane advice only in adversity. They forget all about it when everything is fine. Winters are quite beautiful in Santa Clarita, but they can also be quite uncomfortably cold. You need to know that your furnace will be there for you whenever you need it so that you can make it through winter comfortably. Your Heating system is perhaps the hardest working, and most essential part of your home. It performs every single day, may it be your trying to cool your home or heat it up your furnace has a blower motor inside it that works for your heat and cool. So, it shouldn’t come as a surprise that it needs to be taken care of. We recommend a simple annual tune-up on your heating system to check for worn parts, diagnose the performance, and make minor adjustments. Annual tune-ups keep your system operating at peak efficiency. This saves you money on your utility bills throughout the year, and helps prevent catastrophic break downs when you least expect them. With something as simple as a Heater Tune-Up performed by our service professionals, this is no problem we can help reduce the possibilities of your heater leaving you when you most need it. We will work with you every step of the way to ensure that you get a consistent, reliable and effective performance from your heating system. From heating installation and replacement to routine heater maintenance and unexpected heating repairs, our local heating technicians do it all. When it comes to heating system service in Santa Clarita, CA, there is no time to waste. Annual maintenance and tune-ups of your heating system are important to the upkeep, Safety and efficiency of your equipment. Over 75% of all repairs can be prevented with proper maintenance. Are you feeling dissatisfied with the airflow of your furnace? Are your energy bills piling higher without any explanation? Have multiple repairs become a costly? If any of these apply to you, we’ve got the solution. The fix for all your HVAC headaches is regularly scheduled tune-ups. When Tune-ups are scheduled you can expect that we’ll always show up on time. We strive to not only offer you the best in-home installations and repairs, but also work with your existing equipment, and keep it at its best. Avoid costly energy bills, or worse, by taking care of your home’s central heating equipment. Furnaces offer so much comfort to our families. They always seem to be there when we need to adjust our surrounding and find just the right balance for our homes. It’s important not to take their utility and efficiency for granted, and show your systems a little care. Your technician can discuss with you your heating needs and recommend a new furnace that can best meet your home requirements and your budget. Most residents in Santa Clarita look for ” The best furnace” to be installed in their home. Instead of focusing more on which company to use to install their new heater. A big number of repairs needed within the first few years of a furnace installation are due to poor installation. At Pacific Coast we focus on designing our Furnace installations so that they will perform as quiet as possible and provide lasting results. We also take the necessary steps to inform our customers about the high efficiency systems that are available on the market today to meet their needs, to prevent future Furnace Repair we work with only the best brands. Our Furnace installation comfort specialists focus on energy efficiency, which means when it is time for a new Furnace we will help you find a system that uses the least amount of energy by ensuring the system is designed for your home to help lower your impact on the environment and on your utility bills. Want to know why your neighbors and friends use our company call us for a free Furnace installation quote in Santa Clarita. 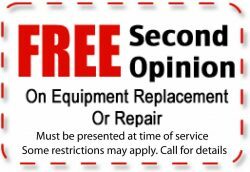 If you suspect that your heating system may be beyond repair, consider purchasing a new unit from us. We’re happy to help you select the right one. Give us a call at (661) 282-2169 to request a quote or discuss a new unit!